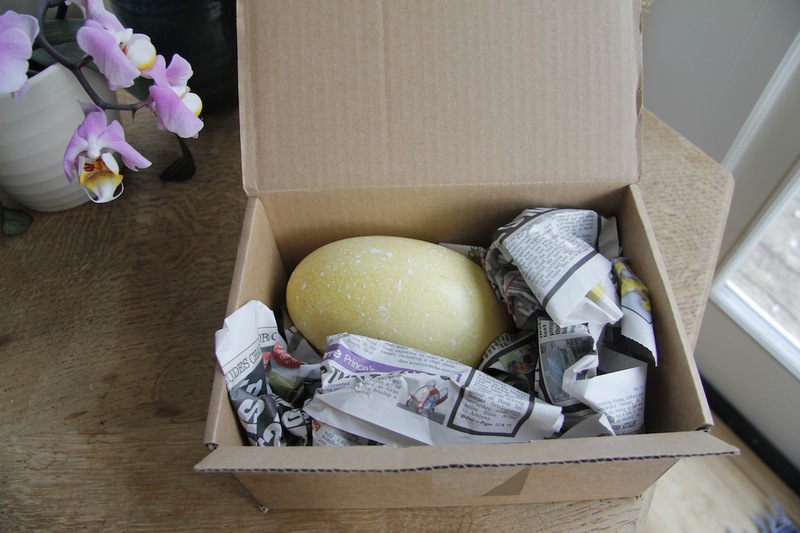 The parents of the vets where James works keep Rheas and yesterday she very kindly gave us this rhea egg – how utterly fabulous is that? So the question is do we try and incubate it and hatch out a baby rhea or do we eat it? Lovely brunch or cute fluffy chick? If we do incubate it do we get a bird to sit on it? Silkies sit well but this egg is huge – they would slide off the edge – and the turkeys aren’t ready for sitting again yet – although they are laying. If we do try and hatch it, it might not work, if we eat it how shall we cook it – scrambled, boiled, an omlette? So what do you think we should do? 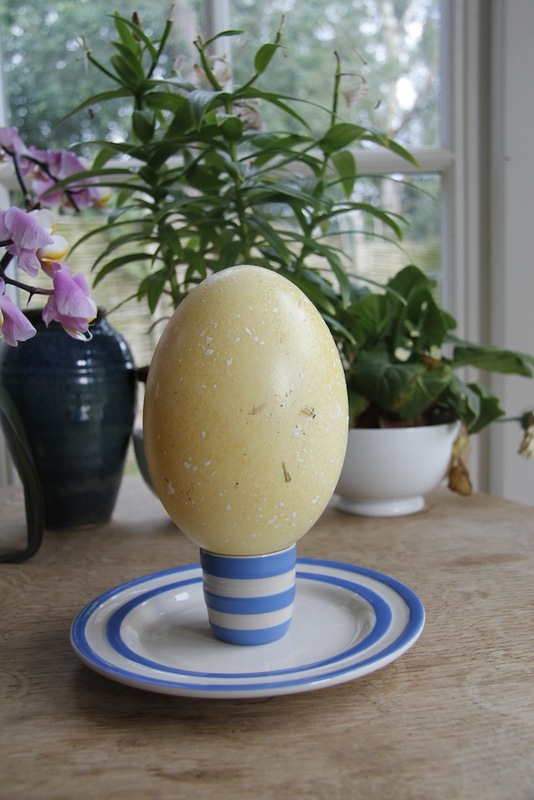 Rhea egg in a normal size egg cup! On the other hand, wouldn’t it be lonely if it did hatch and was all alone without other rheas? Incubate it Claire on the basis of sheer curiosity! A baby Rhea would be awesome! What ever you decide to do, it would be cool to see pictures of the end result. I also would like you to incubate. Would the turkeys let him/her join their flock? Since I have no idea what a Rhea is, I vote to incubate it and let me see how it turns out. By the by, I’ve heard recently that peacocks are supposed to be great “guard dogs” for the other farm animals. Have you thought of those great birds for the farm? Hi Mary, we already have an accidental peacock – Percy isn’t ours but lives in the village. However, he spends a lot of his time up here trying to impress our hens and turkeys with his wonderful tail. James has just finished building me gates for my peacock palace (aka the turkey enclosure and future goat home) so I am thinking of getting a peahen for percy. The only downside is the man selling the peahens wants to offload another peacock as well. I think this would be delightful, but they do make a lot of noise which the campers might not appreciate. So now I’ve googled this bird. Says it can disembowel a human with one blow…That must be a BIG bird. No contest! You must incubate it and grow a baby rhea. How cool would that looking pecking about with the chickens? HHhhmmmm – are you SURE it’s not an alpaca egg? You were very convincing – you had the kids going for a moment there! If you hatch it you know it will only end up running away to Essex like the last escaped Rhea, so I think you should make omlettes.